We had a vacation, all-too-short, with our grands at the beginning of the month. 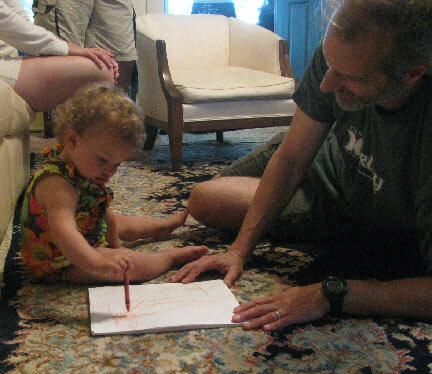 It was lovely to have long summer days to spend getting to know them better, doing projects with them, and finding out that the baby likes to draw!! Above is a picture of Katherine after we went on a highly successful treasure-seeking walk. We added some of our treasures to plastic bottles with colored sand. 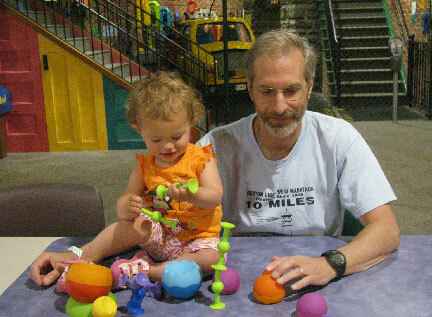 Another day we visited the Rochester Museum of Play in Rochester NY. What a great time! There were all kinds of activities to try and crafts to do. 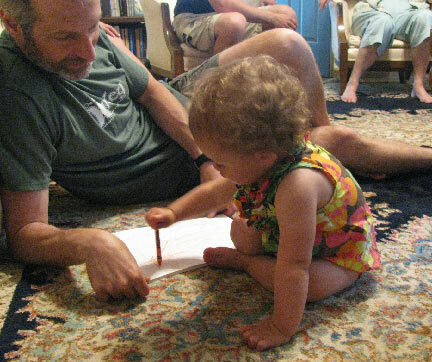 Back at the homefront, Grampy discovered that Little Miss has a thing for crayons. She's just a bit over a year, so we're pretty pleased. We've got one picture of Dani at 9 months drawing, so maybe this is a good sign...? We also did fridge magnets, but I forgot to take a picture! Take a peek inside the studio of Erin Prais-Hintz of Tesori Trovati Jewelry as she prepares for her exhibition at Gallery Q - and be in with the chance of winning one of her beautiful and unique Q Marks the Spot necklaces. Cyndi has finished a second bead embroidery cuff featuring pleated shibori silk ribbon, and she's provided a tutorial too! My Pastel Statement Necklace is featured in the summer issue of Perles et Cetera magazine. What is unique is the addition of an applique for the pendant. Here are some pros and cons about Craftsy.com's Knit Lab class. The old time feel of this card evokes Eileen's childhood memories of 4th of July festivities, hot summer days and cool lemonade. Directions for this stamped card included. Who knew that fabulous paint could be swirled to create stunning designs under resin. Jean reviews the book Punk Chic Jewelry by Erin Siegal.. You are going to love this wonderful book by the amazing Erin! 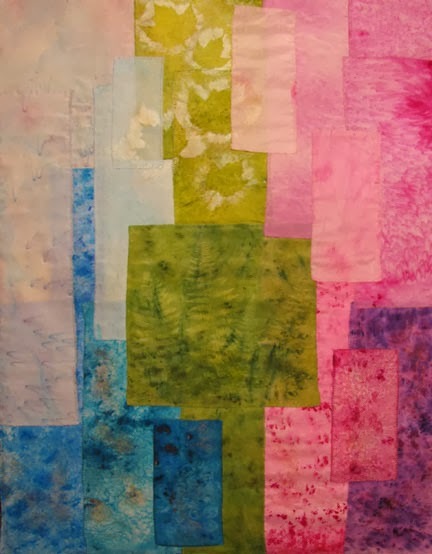 Here are the links to my finished art quilts. Often the tutorials are posted in several parts, but you should find the links to earlier posts are each of the posts listed here. Don't miss the additional information on techniques that you will find at my Fabric painting link. What's on your beading table today? Lisa's getting creative in hopes of having something new to wear tomorrow! Cyndi finished up her project that combines shibori silk ribbon and bead embroidery, and has posted the rest of the tutorial! Carmi has given up trying to bead in a traditional manner - hence the crazy cuff. Looking for a way to store your circular knitting needles? Here is a different solution. It's been a long time since Cyndi worked with image transfers...here's a new variation that she worked out! You can piece Lazertran Inkjet Decals to create a larger image te 8 1/2 x 11. If you've ever made long printed posters where you have to overlap and make seams match or have ever matched seams to hang wallpaper, you know the basic technique. This week in a two part post, Carmi took a tray that was recycled into charms for jewelry making...and upcycled it back to a tray with resin! Jean got some fun news about a great book ! It is all about Jewelry Making Daily and Wire + Metal this week! See her blog! 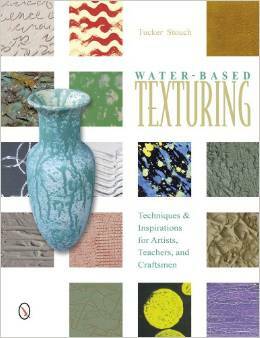 Tucker Stouch has a clear purpose in her book Water-Based Texturing, released recently by Schiffer Publishing, and that purpose is to teach you how to emulate the textures all around you, particularly natural ones, by using water media and tools that are readily found in craft or hardware stores. She begins with a brief description of the products and tools she uses the most, plus a list of resources and a discussion of the importance of texture in art. From there, it's one gorgeous technique after another! 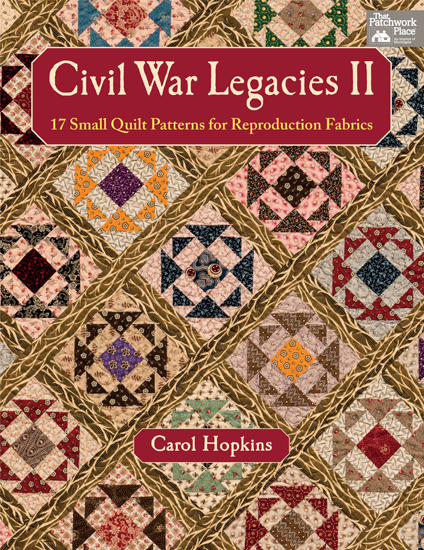 The majority of the book is given over to step-by-step instructions for the various samples she shares. Tucker uses a consistent wood panel so that you can compare the techniques in a meaningful way, but she also shows you many examples of the techniques used on other materials. As you would expect with a Schiffer book, the photos are beautiful and will inspire you to want to push the limits of the ideas shared as well. 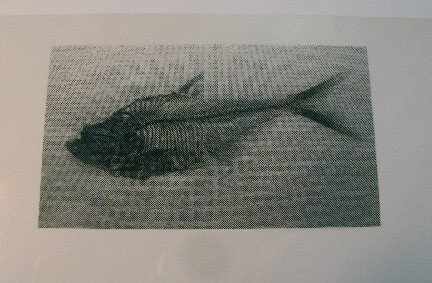 I have many photos of fish skeletons that I took at the Smithsonian Museum of Natural History, and the stark contrast in them made me think that they might make a pretty good image transfer. I wanted to try something just a little different, so I came up with a variation on one of my favorite methods, the Inkjet to Fabric Transfer. The major difference was that I wanted to add paint and gesso to the fabric first, hoping to get a grainier result...and it worked! 1. 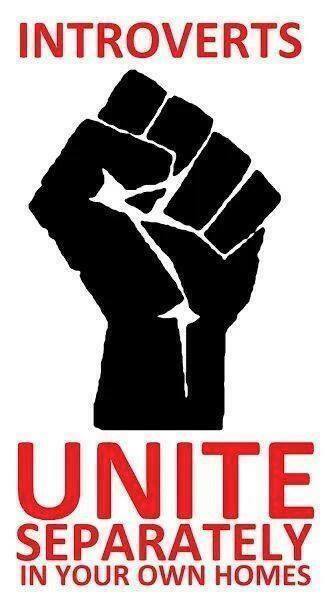 Cut cloth to size and iron. 2. 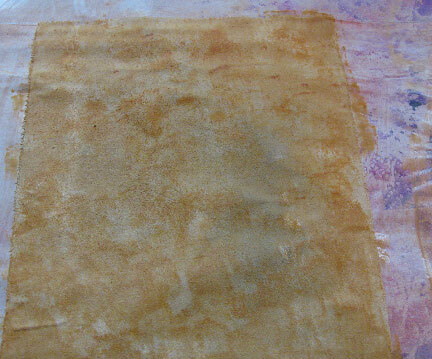 Spray with water and paint with yellow ochre. 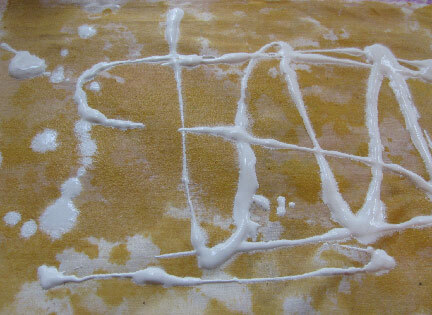 Top with white gesso and spread around. 3. Sponge with quinacridone gold. Let dry. 4. Size the image and print out on an inkjet tranparency sheet. 5. 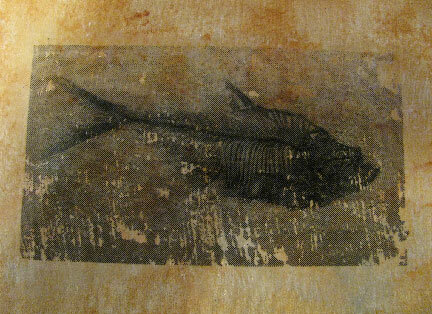 Stroke on a light coat of liquid polymer medium where the image transfer will go and quickly place the image down on the fabric, burnishing the back. Pull off the transparency before it dries to the cloth. 6. Let the image dry thoroughly before using in a project. Do you go through bead phases? Lisa's sharing her latest one...Beads, charms and pendants with faces. Cyndi shares the first part of her new tutorial on working with pleated silk shibori ribbon and using it in your bead embroidery. Baby afghan projects are one great way to clear out the yarn stash so you can make room for more yarn! The best reunion jean never attended! And she made the bracelets! See jean's blog for the amazing story of this transforming experience. Like peeling layers from an onion, many layers on decoupage can make you cry. 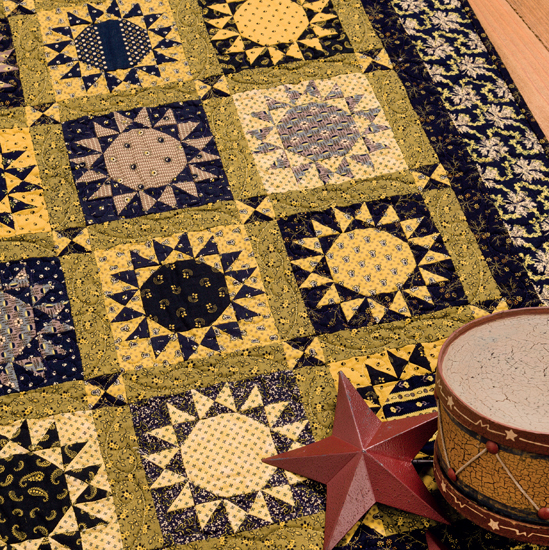 The Artful Crafter tells you how to keep it simple and tear-free. 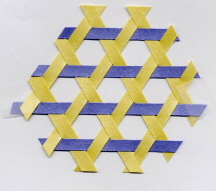 Are you familiar with triaxial weaving? Instead of the 90 degree-cornered warp and weft weaving that most of us know and love (remember making fabric loop pot holders as a child? 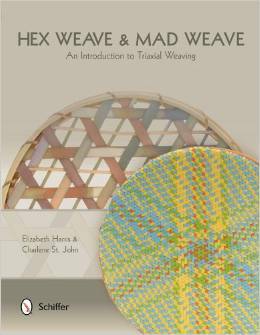 ), Elizabeth Lang-Harris and Charlene St John want to introduce us to the world of triangular 120 degree weaving. Say what?? Yup, in their new book, Hex Weave & Mad Weave, published by Schiffer Publishing, the duo stretches your view of what weaving can be. The fabrics or papers woven this way are very strong, but not flexible, so you'll want to consider that carefully when choosing a weaving project. You're probably not going to be wearing it! The hex and the made weave are the two simplest, thus the best to start with. Both can be woven with no loom...great news, huh? 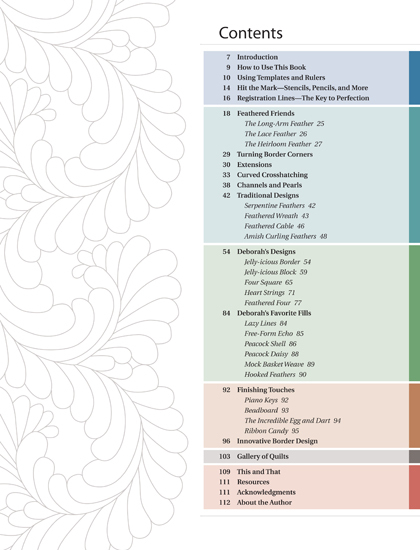 The techniques, patterns, and projects increase in difficulty, so prepare to work your way through the book rather than dip in and out. In the back of the book, there is an angle guide and graph paper which you can copy and use to help you figure out color patterns you like. It's pretty amazing the variety of designs that these weaves can achieve just through varying the colors. 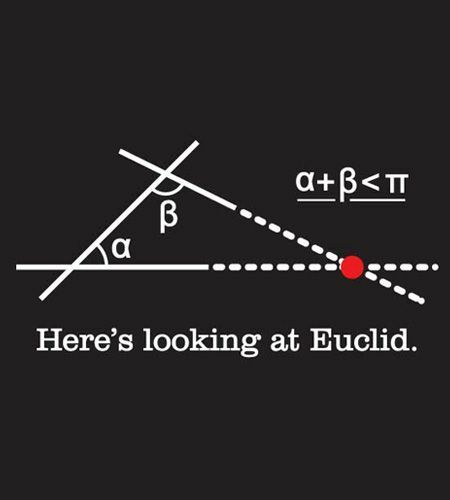 Soon you'll be walking around seeing triangles and hexagons everywhere! I'm gonna have to be honest, because I always am about books...washi tape is not my thing and probably won't ever be. 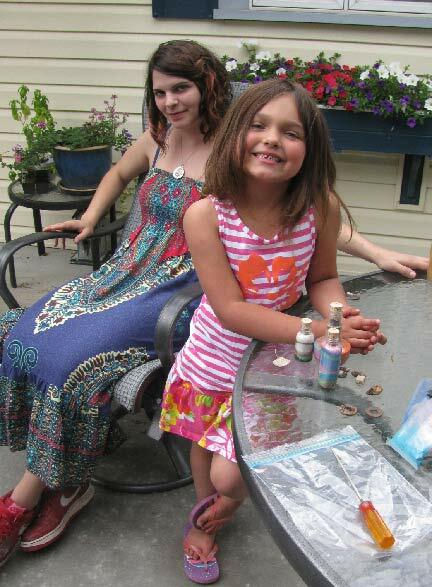 I'm not into cute, except when I'm making stuff with my granddaughter. So, ok, I guess there's an outside chance of me using washi tape, but it's pretty slim. 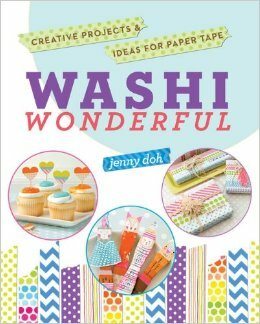 On the other hand, if cute is your thing, you can't go wrong with Jenny Doh's Washi Wonderful. Washi tape, in case you haven't heard, is a colorfully patterned paper tape that comes from Japan. 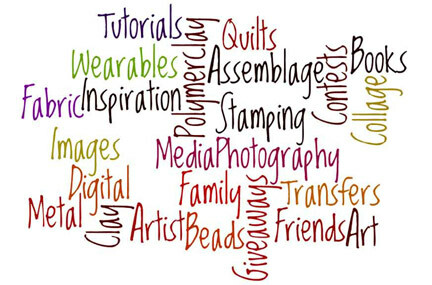 It is used to "cuten up" all kinds of projects, from home accessories and gift items to cards and boxes. There are over 50 projects in this book, and since it is from Lark Books, you know the layouts and photography are exceptionally beautiful. 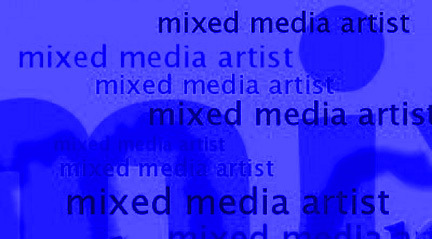 There is good information in the Basics section on how to handle the tape and how to store it once the rolls begin to take over your studio. The tools you will need are few and readily available. 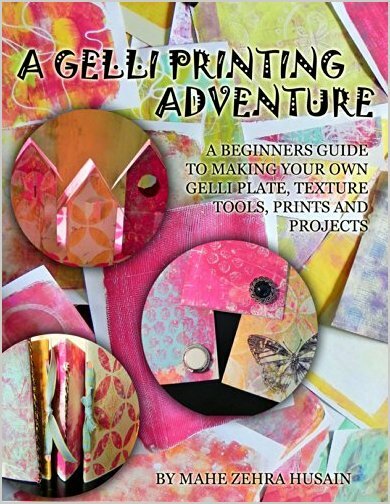 I really think that people who are into making cards will particularly love this new book, as cards and gift wrap dominate two major sections! 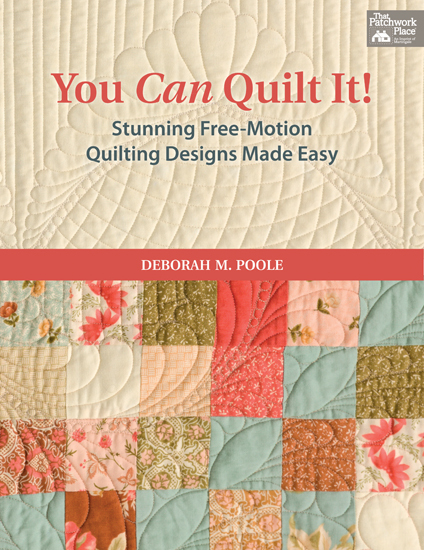 When I found Laura's site, Wild & Free Designs, it was just in the nick of time! As often happens in the springtime, I had been going through a short but deadly burst of "clean it all up and throw it all the heck out" fever. And my beautiful globe almost fell prey to that impulse. My DH bought me the globe for my birthday one year, many many moons ago when there was still a Soviet Union and a divided Germany. Alas, the globe had ceased being useful, but it was still so pretty, and I hated to throw it out. I thought about painting it and repurposing it, but couldn't quite come up with anything. So I did what everyone does these days...I turned to google. 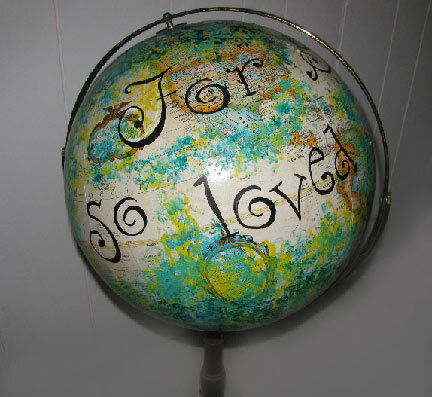 Typing "painted globe" into google images, I learned that many people were trying their hand at redecorating the world, but no one was doing it better than Laura. So I dove right in, and while I'm very happy with how my globe came out, I would do one thing differently if I had it to do over: I would crowd the writing so that more or less the whole phrase could be read from one angle. My phrase is "For God so loved the world", but you can only see it all if you spin the globe. 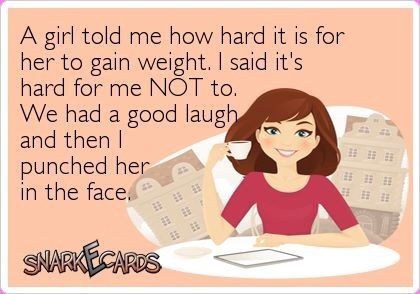 Which I guess is alright anyway! 1. I chose to do the writing first and then paint around it. You could easily do it the other way, but make sure you use a marker pen that won't get clogged up by acrylic paints. I used a Sakura Permopaque in black. 2. Sponge acrylic colors around your phrase, covering as much or as little of the rest of the globe as you want. 3. Touch up your writing if needed. No, I'm not leaving home, but I've decided to take a break from thinking, planning, and writing for a week. Probably not from making, though :-) You have to draw the line somewhere! I'll be back in the saddle and posting again next Monday, starting with a tutorial for a globe that I painted, just for fun!